There was a real feeling of camaraderie and shared aspiration. Yet the (Vienna Philharmonic) orchestra was riddled with anti-Semitism, and Solti’s relations with it were frequently troubled. When he later received the Gold Medal of the Gesellschaft der Musikfreunde for the Ring and other opera recordings, practically no one from the professors of the orchestra committee turned up. They all had their excuses – teaching, travel or prior engagements. 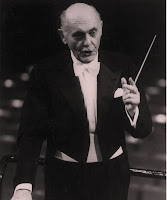 On the morning of the presentation day, Solti was telephoned in his room at the Imperial Hotel and a woman’s voice said, ‘They are not coming because you are a dirty, Hungarian Jew.’ After receiving the award, as Solti walked along the corridor, the door of the office of Ernst Vobisch, the orchestra’s Chairman, was open, and all the missing committee members were sitting there having coffee. Vienna doesn’t change. The much-missed John Drummond recalls Georg Solti and 1960s Vienna in his autobiography Tainted by Experience (Faber, ISBN 0571200540). For more on this terrible subject read about a rare performance of a holocaust opera. My local opera company, the Los Angeles Opera, has launched a series of operas/concerts called Recovered Voices. It's a pet project of James Conlon, as he tries to get Schreker, Zemlinsky, Braunfels, Korngold and Ullmann played more. LAO is doing a double bill of Zemlinsky's fantastic Der Zwerg and Ullmann's Der Zerbrochene Krug in February, 2008. Nice, but I'm *really* looking forward to the fully staged Schreker opera, which will probably be Die Gezeichneten. Thanks Henry, and developing that thread there is an article about a pupil of Franz Schreker in the Overgrown Path upload queue right now. Hmmm... are you following the Overgrown Path to Krenek? "It was amazing what these young Schreker students could do. We gave them contrapuntal problems to solve, examined their strict and free styles, heard one fugue after another (both vocal and instrumental), gave them themes for modulation and improvisation, examined their musicality and ear training - these students were skilled in everything. As many exams as I have witnessed since, I have never again encountered such an artistic level." Henry, very perceptive - and dead right.